Citations are crucial to your local rankings in Google. Not only that, but being listed on lots of these third-party sites (AKA “citation sources”) can help you attract customers from a wide variety of sources. You may know where to get citations, and you may know all about how to go about building them. You may even use the excellent Local Citation Finder. But you probably don’t know whether you’ve gathered all the citations you need—or all that you humanly can gather. That’s what this list is for. It’s the product of 4 years of jotting down every citation source I’ve encountered. The local-search landscape constantly changes, so I will keep growing and perfecting this list. I know there must be some good sites I’m missing, even now. I’d love any suggestions (see bottom of page). If you’re looking for citation sources for Germany, New Zealand, Ireland, Spain, the Netherlands, or South Africa, go check out Nyagoslav Zhekov’s great post on “international” local citations. If you run a business in the US, you’ll only really need to pay attention to the first two sections. You may also want to skim sections 3-5, but that’s icing on the cake. 1. The sites in the “data-aggregators” section aren’t really citation sources, but they help you earn citations, which is why I’m including them. 2. None of the sites requires a reciprocal link from you. In other words, this list does NOT include the types of sites that will list your business only if you paste their stupid link and logo on your homepage. I haven’t found that those sites are important to anyone’s visibility— except theirs. Your site should be about you. 3. All the sites are free to add your business to, with a few exceptions (which I note in the list). On the off-chance you try to list your business on one of the hundreds of other sites on this list and are asked to pay a fee, please let me know (in which case I’ll either note down that fact on the list or — more likely — remove the site from the list entirely). 4. Red = the most important citations to gather for Google local rankings, regardless of your industry or location. 5. When I write “verification required” next to one of the sites, that usually means that the business owner or someone in the company has to go through a verification process (often by phone) in order to create or gain access to a business listing on that site. 6. A few sites no longer have free self-serve “submit a listing” options because they’ve got a near-exclusive partnership with Yext. That means that in many cases the only way to add or edit a listing on one of these sites is to pay for Yext (although there may be creative workarounds). 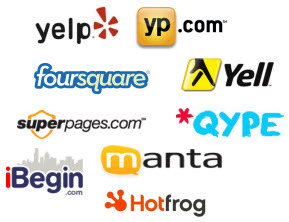 I’ve labeled those sites, “Powered by Yext.” I’m including them in case you want to check your listings. How can I improve the list? Any thoughts you have about the relative importance of any of the sites—like how you’ve seen them influence your Google local rankings or someone else’s. In other words, which ones would you suggest highlighting in red? Thanks to Kirk Pomerleau, Bruce Mishkin, and Holly Pedit for their contributions to this list early on. Special thanks to Nyagoslav Zhekov of Whitespark (formerly of NGS Marketing) for a long list of insights that helped make this list better. Other people who’ve contributed include Andrew Webber of SEO Maverick, Zachary Palmer of Divot Agency, Chris Sheehy of SidewalkBranding.co, Stephen Brown of Brown & Rice, P.A., Hayden Williams, Michael Gottesman of Biz Tech Coaching, Rod Marchant-Smith of Peninsula Air Conditioning, Marc Poulin, and Alan Bleiweiss. Please email me with any suggestions, advice, or questions you’d like to share! P.S. Want help with your citations? I suggest Whitespark’s citation-building service. But if you want help with citations and the rest of your local visibility, check out my services.